Loft conversions are a versatile way to add space and value to your home, but converting a loft can be a complicated and expensive process. Make sure you know these five key things before you start work, to ensure your conversion is as stress-free as possible. 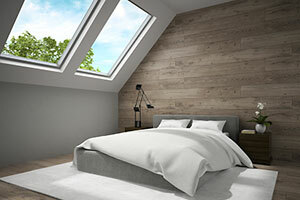 Read on for our tips and need-to-know advice, and don’t miss our comprehensive guide to getting your loft converted for more in-depth information. The type of loft conversion you choose will make a big difference to the price. The cheapest type is a simple conversion that uses the current space in your loft without building out from the roof. At the other end of the scale, the most expensive is a Mansard conversion, which runs the whole length of the house and will change your roof to make it almost vertical. You can find out more about the average cost of different types of lofts, as well as expert and homeowner tips on how to save money on your conversion, on our loft conversions costs page. Did you know that for the majority of loft conversions, you don’t need planning permission? Homes have a built-in allowance of permitted development; an amount they can extended by outside of the original building. It’s often only when a loft goes outside this that planning permission is needed. Although you might not need planning permission, you will need to satisfy building regulations – and this can affect more than just the loft space itself. For example, certain homes (depending on how they are laid out) will need to have new fire doors fitted not just to the loft, but other rooms too. Planning permission can take a long time to get approved and it’s worth knowing what building regulations will affect your home, so take a look at our planning permission and building regulations guide to check what’s needed for your home. To have a loft conversion, the distance between the floor and ceiling has to be at least 2.2m at the tallest part. If your loft doesn’t measure up, you’ll need to consider lowering the floor or changing the roof, which will cost a lot more. Measure the height yourself to get an initial idea, and if it’s too short, call a professional in early on to advise you. If your house isn’t detached, you’ll need to get a party wall agreement before undertaking work that affects walls that you share with neighbours. This is basically an official agreement from your neighbour that they are happy for you to do work on a wall that adjoins their home. It’s best to try and get this sorted as early as possible to give you leeway if there are any disagreements and delays. For more tips on unexpected pitfalls that could delay or derail your loft conversion plans, visit our page on insider tips from homeowners and experts.